In the north of France the principal industries are the manufacture of iron and steel, and coal mining. The nationalised mines in the north are administered by seven Groupes, each with its own railway system and locomotive stock. The engines for the most part are 0−6−0T and 0−8−0T built by Fives Lille and La Meuse, the remainder being from Schneider, Corpet Louvet, Cail, Franco-Belge, Couillet, Cockerill, SACM, and Energie. The oldest are a batch of 0−8−0T supplied by Fives Lille to the Mines d’Anzin in 1873. Whether these are still in service is doubtful as dieselisation is proceeding apace, and in November 1962 three Groupes (Auchel-Bruay, Bethune, and Henin Lietard) were reported as having no steam locomotives in service. The locomotives of the Mines de Courrieres (Henin Lietard) are noteworthy in that they are all named, as well as numbered, which is unusual in France. (The names are those of towns, villages and rivers in the surrounding district.) Apart from four at Bethune, the only vertical boilered Cockerill 0−4−0T in the northern mines are at Lens (Lens-Lievin Groupe). At one time they were named after Saints, but over the years the names have gradually been removed and probably none now remain. 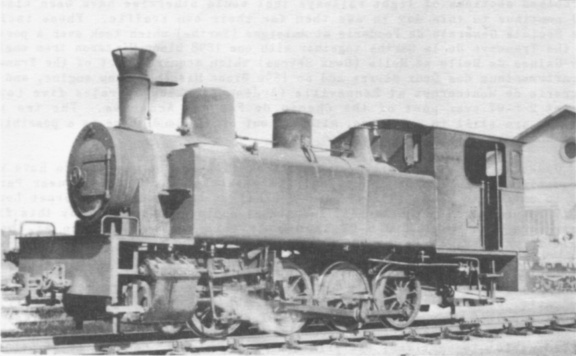 The Lens-Lievin Groupe possess the last remaining colliery locomotives with inside cylinders, these being six 0−6−0T supplied by Fives Lille between 1914 and 1925, and named after some of the old French provinces. They incorporate a steam winch for emptying coal trucks direct into barges on the canal, and it is for this reason that they were built with inside cylinders. The most recent steam locomotives acquired by this Groupe are two 2−10−2T from the Est Region of the SNCF. It is interesting to note that the locomotives here are numbered in the same style as the old Nord Railway, whereby the first digit of the running number indicates the number of coupled axles. The smallest of these northern Groupes, Oignies, is the only one to use orthodox 0−4−0T; it has two interesting 0−8−0T built by the little known Belgian firm of Boussu. The Douai Groupe stock is mainly standard Fives Lille and La Meuse 0−6−0T and 0−8−0T, supplemented since 1951 by ten 0−8−0T and four 0−10−0T from the SNCF. Dieselisation commenced in 1960 and it is the intention to replace the large stud of steam engines with twenty-three Bo−Bo diesel-electrics very similar to those of class 040DE on the SNCF. Centred on Valenciennes is the largest and most interesting Groupe, for it operates the Chemin de Fer de Somain à Anzin et la Frontière Belge. This line, which links Somain with Peruwelz in Belgium, is 38 km. long and a regular passenger service is operated with vintage stock hauled by one of a series of six 2−6−0 tender engines supplied new by Fives Lille between 1905 and 1908. The passenger trains are threatened with early withdrawal as modernisation of the system proceeds, for it is claimed that they hinder operation of the coal trains! Since 1955 the locomotives have been numbered according to type, with class letters (carried by the engines as a prefix to the number) running from "A" to "M". The oldest locomotives at present are some class "C" 0−8−0T built by Fives Lille in 1873, the newest a class "F" 0−8−0T by the same builder in 1947. Between 1955 and 1957 sixteen 0−10−0T were obtained from the SNCF to replace older locomotives which included six enormous La Meuse 0−6−6−0 Mallet compounds. Dieselisation has now commenced with the introduction of the same type of Bo−Bo diesel-electric locomotive as used in the Douai and Hethune Groupes. 75 cm. gauge No. 5 ALBERTINE (St. Leonard 1654 of 1910) of the Societe Metallurgique d’Aubrives - Villerupt at Villerupt on 17th June 1961. Lower No. 29 (Humboldt 690 of 1910) of the Societe Metallurgique de Knutange on 16th June 1961. One of the very last French steam industrials (or French steam of any category for that matter!) SACM (Graffenstaden) 8157 of 1953 - at a colliery in the "Bassin Cevennes" group on 22nd July 1962. Lower 12 BOIS du CHA (Heische) 11599 of 1912) at Hauts Fourneaux de la Chiere on 19th June 1961. The principal steelworks in northern France belong to one or other of the large combines and most are either partly or completely dieselised. However, the USINOR works at Louvroil was still mainly steam worked in 1961 with a collection of 0−4−0T and 0−6−0T by La Meuse, and one of the few remaining standard Pinguely locomotives. The Isbergues works (of the Compagnie des Forges de Chatillon, Commentry at Neuves Maisons) must surely be unique in that none of its thirteen steam engines was built in France. However, Renault diesels are now being delivered to remedy this! The remaining industrial locomotives in the north are to be found at various cement works, quarries, ballast pits and sugar factories which abound in the region. The familiar vertical boilered 0−4−0T of Cockerill, Cail, and Fives Lille are great favourites. The quarries and sugar factories have been well served by narrow gauge lines in the past, but most have now been closed. The largest narrow gauge system was that operated by the Societe F. Beghin at Vis en Artois. 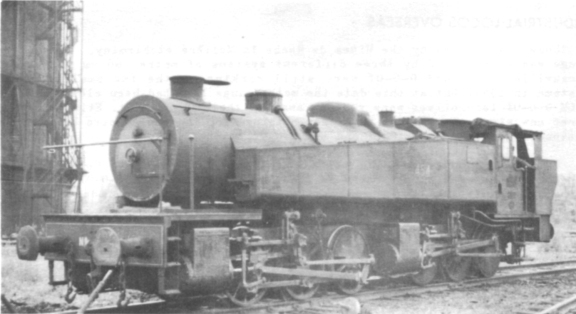 Closed in 1958, it had more than twenty 60 cm gauge Baldwin 4−6−0T and Alco 2−6−2T built for use in World War 1. By way of contrast, other sugar beet systems make use of the German Deutsche Feldbahn 0−8−0T. At the Sucreries Ternynck, at Coucy le Chateau, is to be found the last surviving 60 cm gauge Decauville 0−6−2T and four fine 0−8−0T. 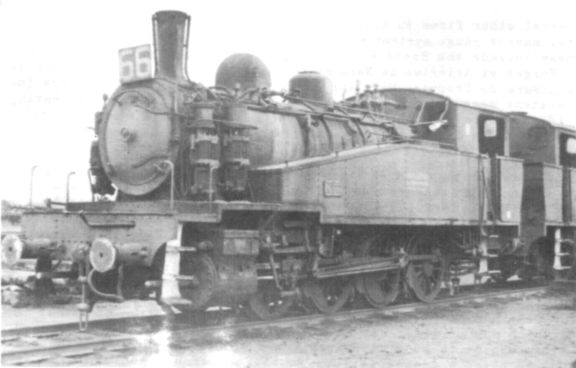 The latter were built by Franco-Belge in 1944 to German order for 75 cm gauge lines at the Russian Front, but were subsequently converted to 60 cm gauge before resale. The system here is reported to have closed in 1962, but there are plans afoot to preserve the Decauville engine and it is possible that the Franco-Belge locomotives may find employment on another sugar beet line. 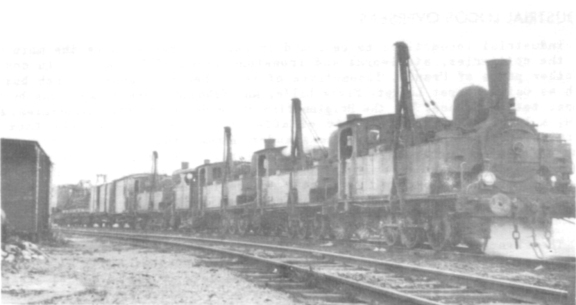 Other interesting locomotives in the north are the two old Paris-Orleans Railway tender engines (435, a 2−4−0; and 781, a double-framed 0−6−0) that have been derelict for years at M. Becker’s gravel pits at Soissons; the unique 0−4−0T by Warin of St. Waast (built in 1887) at the Produits Chimiques et Engrais d’Auby, near Arras; and the rare 60 cm gauge 0−6−0T by Popineau possibly the last of the line - at the Carrieres de Villeneuve les Verberie, which unfortunately was scrapped at the end of 1961. The Warin locomotive was offered for sale early in 1962, and will doubtless also be scrapped. A great variety is to be found in French industrial locomotives for, in addition to those built in France, there are many from Belgian and German firms, to say nothing of the British, American and German locomotives that have found their way into industrial service following a period of use with the various armed forces during World War 1 and, to a lesser extent, World War 2. One has only to cross the English Channel to Calais to be on the threshold of one of the most important industrial areas of France, and in Calais itself there are one or two firms using steam locomotives. But let us first consider the industrial locomotives to be found in eastern France where the main users are the collieries, steelworks and ironstone mines of Lorraine. In contrast to other parts of France, locomotives of the other well-known French builders such as Cail, Corpet Louvet, Fives Lille, and Schneider are conspicuous by their almost total absence, but the Belgian firm of La Meuse is well represented, as is SACM, a local works. This state of affairs is explained by the fact that Lorraine, together with Alsace, was under German rule from the time of the Franco-Prussian War in 1870 up to the 1914-1918 War, and the majority of the locomotives purchased during this period were of German origin. Hence French builders apart from SACM did not get a chance in this district, and at the end of the German Occupation new locomotives continued to be obtained from SACM rather than from other French firms. The French coalmining industry was nationalised on 1st January 1945, and the eastern collieries fall into three Groupes, the largest being the Groupe de Petite Roselle which took over the mining interests of the de Wendel steel firm and twenty-five of their locomotives. These were a mixed lot of 0−4−0T, 0−6−0T, 2−6−0T and 0−8−0T by various German builders and SACM, and also three of the Baldwin 2−8−0 tender engines built for service in World War 1. Since 1945 six 0−6−0T and four 0−10−0T have been obtained from the Belgian firm Energie, together with seven 0−10−0 tender engines from the Eastern Region of the SNCF. Even these carry on the German tradition in this district as they are of the familiar Prussian G10 class, later DR class 57 and SNCF class 050B. The present position here is not clear as visitors are not encouraged! The second largest Groupe is the Sarre et Moselle which has a very modern stock, almost half of the locomotives being 0−6−0T, 0−8−0T and 0−10−0T built by SACM since 1945. Except for four German 0−6−0T the remainder are all 0−8−0T built by Fives Lille and SACM between the two World Wars. The third Groupe is that of Faulquemont-St. Avold, and this is the most up−to−date in that its rail system is electrified at 25kv. Eastern France, and particularly Lorraine, is the main home of the French heavy steel industry and many large firms have works here - SIDELOR at Micheville, Auboué, Homecourt and Rombas; LORBAINE-ESCAUT at Thionville, Longwy and Mont St. Martin; de WENDEL at Hayange, Moyeuvre and Joeuf; and many others. All these firms, large and small, have either commenced or completed dieselisation and/or electrification of their rail systems, so that mow there is a certain amount of standardisation amongst the locomotives as fewer firms are building them now than in steam days. Such steam locomotives as remain in the steel industry are either derelict, in reserve, or having the last ounce of use wrung from them before being replaced by more modern forms of power. The only exceptions to this sad state of affairs are to be found at the three de Wendel works where there are still over fifty well cared for steam engines (see RECORD No.1, page 4), and the Auboué works of the SIDELOR combine which was still fully steam in 1961. The other SIDELOR works use diesel and electric locomotives mainly, but some steam engines survive at all, of which the most interesting are four 0−4−0 fireless locomotives, rebuilt from Baldwin 0−4−0ST of World War 1 vintage, which are in regular use at the coke ovens at Homecourt works. One steam engine survives on the metre gauge system there - Corpet Louvet 1399 of 1912 - held in reserve. At the Micheville works are to be found some of the last remaining St. Leonard engines at work in France, survivors of a once extensive stud of 0−6−0T and 0−8−0T built in the early years of this century. At the Rombas works the only working steam engines are four 0−4−0 fireless at the coke ovens; electric traction has been used there since 1930 and the oldest electric locomotives still extant in 1961 (although withdrawn) were built by Siemens-Schuckert as long ago as 1906 and are reputed to have been obtained from a German tramway company. The unusual winch-fitted locomotives of the Lens-Lievin groupe used for emptying trucks into barges at Pont a Vendin. When this photograph was taken on 12th November 1962 they were the last steam survivors in this Groupe and due to be scrapped in April 1963 when replaced by electrical tipping equipment. 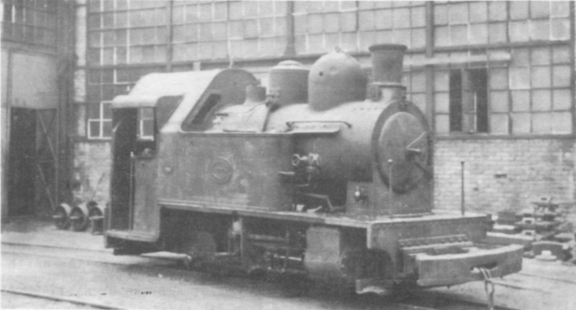 L12 (SACM, Graffenstaden, 7656 of 1932) of the Valenciennes groupe was formerly SNCF 050 TD 31. Houilleres du Bassin du Nord et du Pas de Calais. 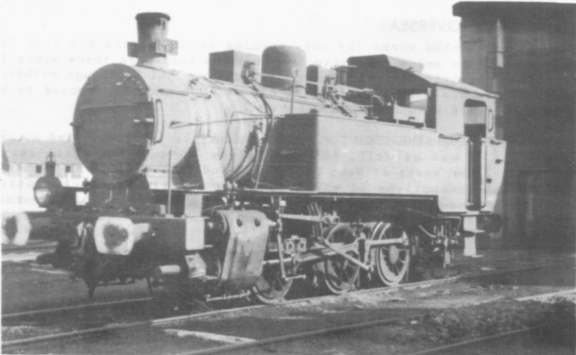 Lower Douai groupe 66 (Schneider 3414 of 1920) was formerly SNCF O4OTA 65. The extensive LORRAINE-ESCAUT works at Thionville is electrified at 25 kv and diesels are in use as well, but some steam locomotives still survive at this firm’s other works at Mont St. Martin and Longwy. At the latter are several fireless locomotives of which some are rebuilds from conventional steam engines. Also in the Longwy district is the Société des Hauts Fourneaux de la Chiers which operates a narrow gauge system at its ironstone mines with the unusual gauge of 74 cm. This, strangely enough, is still steam worked, and more likely to be closed rather than dieselised. The locomotives used are two powerful 0−6−0T built by Henschel with two elderly Tubize engines in reserve. On the standard gauge at this works the only steam engines are ten fireless built by La Meuse between 1927 and 1937. Not far from Longwy, at Villerupt, is the works of the Société Métallurgique d’Aubrives-Villerupt which is served by a 75 cm. gauge system, in addition to the standard gauge where only one steam engine survives. However, the four narrow gauge locomotives built by Orenstein & Koppel and St. Leonard - the earliest in 1905 - continue to flourish. Several other firms in this area of eastern France have operated, or still operate, narrow gauge systems at their steelworks in addition to standard gauge, and these include the Société Métallurgique de Knutange (70 cm. - closed in 1961), Forges et Aciéries de Nord et Lorraine at Uckange (66 cm.) and Union des Consommateurs de Produits Métallurgiques et Industriels at Hagondange (metre). These systems were all worked by German locomotives, the majority having been built in the years just prior to World War 1. The Uckange system is still steam worked, but Moyse built diesels have taken over at Hagondange though one curiosity (a La Meuse fireless of 1949) is kept in reserve. Other steelworks exist in Lorraine with various steam and diesel locomotives in use too numerous to mention, but no account would be complete without a mention of the wonderful collection of motive power that was to be found at the Aciéries de Pompey, near Nancy, until recently. None of the engines was obtained new and they were mostly 0−6−0T built in the late 1870’s and acquired from the Chemin de Fer de l’État and the SNCF between 1913 and 1945. 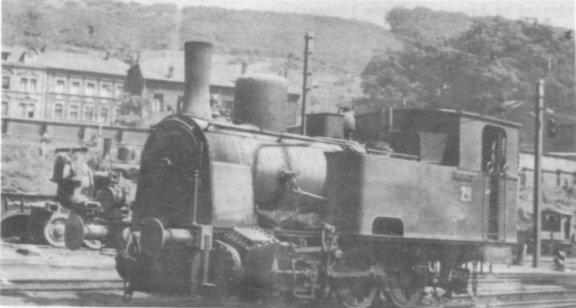 The remainder of the stock consisted of four extraordinary looking 0−4−0 well tanks alleged to have been built by Corpet in 1880, and one 0−6−0T built by the Belgian firm, Gilly. 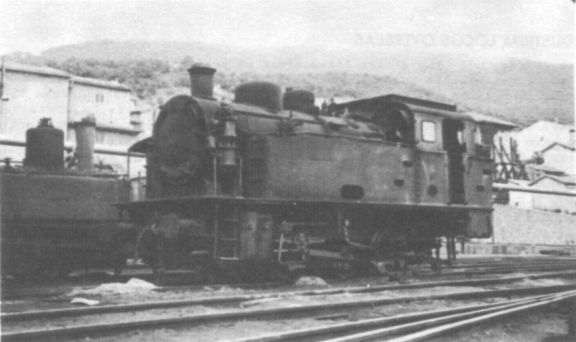 Several of the locomotives were scrapped in 1958 and the rest had been withdrawn by 1961 with the exception of one of the État 0−6−0T which was still in use at the firm’s small works at Dieulouard. The last steam engine to work at Pompey was a well tank pressed into service in May 1961 to cover a diesel failure, and afterwards withdrawn from service. The remainder of France is not highly industrialised, and the locomotives to be found can best be considered in relation to the industries that make use of them. Although the principal coalfields lie in the north and east there are smaller ones in the Loire Basin, the Cévennes, and Aquitaine. The largest of these, the Houillères du Bassin de la Loire, operates pits in a widely scattered area centred on St. Etienne. Here the locomotives are kept at the individual pits instead of at large central depots as in the north and east. When nationalised, the standard gauge locomotive stock was indeed a motley collection, varying from Baldwin 0−4−0 saddle tanks to old main-line engines dating from 1856. Hardly any two engines were alike, with the exception of those contributed by the Mines de Roche la Molière et Firminy. The narrow gauge was represented by three different systems of metre, 60 cm and 50 cm. 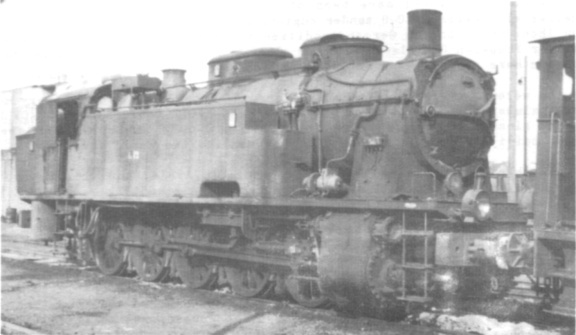 Decauville 0−4−0T and 0−6−0T were still working on the two smaller gauge systems in 1954, but at this date the metre gauge line had been closed and its SACM 0−6−0T locomotives were rusting away in their shed at St. Etienne. Only three new steam locomotives have been obtained for the whole Loire Basin since nationalisation - one 0−10−0T and two 0−6−0T. In the Cévennes mines the mainstay of the stock are six Corpet Louvet 0−6−0T. These were supplemented as late as 1953 by two SACM 0−6−0T which were almost certainly the last steam engines built in France for industrial use. Over in the Bassin d’Aquitaine, two Groupes have locomotives completely different from other mines in France. At Albi the Groupe Tarn has one La Meuse and one Couillet 0−6−0T on the standard gauge, the Couillet having been converted from metre gauge, and three fine modern Corpet Louvet 0−8−0T on the metre gauge. At Carmaux, also Groupe Tarn, was to be found one of the few Vulcan Ironworks (USA) 0−4−0 saddle tanks remaining from World War 1, and five 0−8−0T. Four of the latter had been obtained new from the German firm of Borsig while the fifth, of the same design, was purchased second-hand from the SNCF in 1950. It had been built by Schneider in 1891 for the old Midi Railway, and was latterly SNCF 040TA 423. Carmaux gave it the number 423, and the other four engines are now numbered 425 to 428! The Groupe de l’Aveyron (at Cransac and Decazeville) is even more interesting. 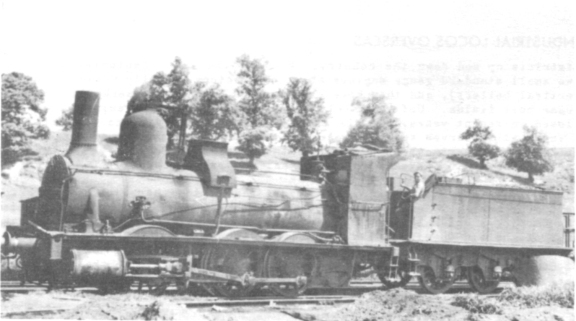 The locomotives at Cransac are two SACM 0−6−0T of 1890 vintage on the standard gauge with two Orenstein & Koppel 0−4−0 well tanks to work the 62 cm gauge system. At Decazeville the standard gauge stock comprises a Borsig 0−4−0 well tank and an 0−6−0 well tank built for the Paris-Orleans Railway in 1861. Its 66 cm gauge system was the first application in France of such a narrow gauge, and is said to have resulted from a visit to the Festiniog Railway by the managing director of the company then owning the mines. (Yet the gauge of the Festiniog in the metric scale is 60 cm. - Hon. Ed.) 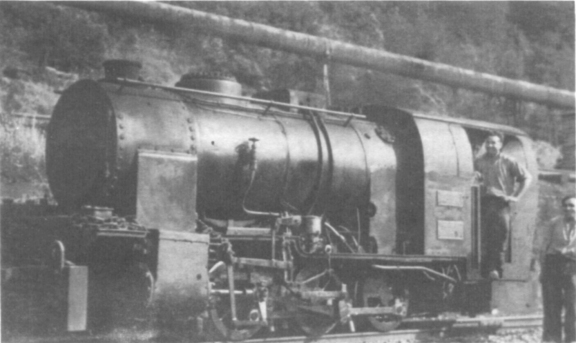 The locomotives were obtained from the Belgian firm of Couillet from the opening of the system in the 1880’s right up to 1920, when one or two were built at the mines. Some other Paris-Orleans 0−6−0 well tanks, even older than the one at Decazeville, were to be found at the Magasins Généraux de Toulouse as late as 1954. Further locomotives have since been obtained second-hand so it is more than likely that these old engines will have been disposed of. Some steel works and engineering firms are to be found at Lyon, St. Etienne and Bordeaux but they use diesel locomotives for the most part, as do the many scattered chemical work of the vast St. Gobain Company which formerly used the familiar Cockerill and Fives Lille vertical boilered 0−4−0T. At Mondeville, in the heart of the Normandy countryside, the large works of the Société Metallurgique de Normandie is now dieselised. 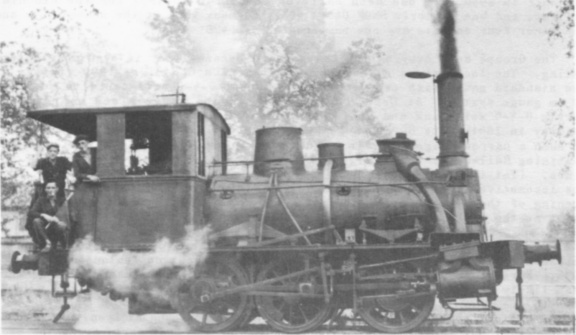 Its former large stud of steam engines included 2−8−2T as well as 0−10−0 and 2−10−0 tender locomotives from the SNCF. A Mallet (454 - Corpet Louvet 1690 of 1926) at the St. Denis gasworks in Paris on 10th June 1954. A near centenarian on 21st June 1954 at the Magasins Generaux de Toulouse was former Paris-Orleans Railway No.1005, built at Ivry works in Paris in 1855-1856. 030A24 (Koechlin 295 of 1856), formerly SNCF, at Talaudiere (Houilleres du Bassin de la Loire) on 18th June 1954. Metre gauge CAMP GRAND II (Corpet Louvet 1831 of 1937) at Albi (Houilleres du Bassin d’Aquitaine) on 22nd June 1954. The only other users of locomotives on any large scale are the sugar beet factories, and various quarrying firms. The bulk of the sugar factories are to be found in the north, but there are quarries and ballast pits in various districts up and down the country. Most of the sugar factories use one or two small standard gauge engines about the factory, usually 0−4−0T (some with vertical boilers), and then have extensive 60 cm gauge networks in the actual sugar beet fields. Unfortunately, many of these narrow gauge systems have closed in recent years, but the Chemin der Fer d’Intérêt Local de Pithiviers à Toury still serves several sugar factories and is worked by a variety of old British War Department and German Deutsche Feldbahn locomotives. The Toury factory has its own system worked by half-a-dozen Decauville 0−6−0T. The majority of the sand and ballast firms, together with the quarries, have gone over to diesel traction by now, but two systems are worthy of mention. The Carrières des Malavaux at Cusset (Allier) operate part of the metre gauge line of the old Chemin de Fer du Centre with am assortment of locomotives from various closed light railways, while the sand and gravel pits of Monsieur A. Gouery at Breuilpont, Eure, are served by a system laid to the very unusual gauge (for France) of 90 cm (3' 0"). It is worked by seven German and Czech built 0−4−0T that are reputed to have been used originally on the construction of Hitler’s Atlantic Wall. In addition to the Carrières des Malavaux, several other firms have purchased sections of light railways that would otherwise have been closed, and continue to this day to use them for their own traffic. These include the Société Générale de Fonderie at Antoigne (Sarthe) which took over a portion of the Tramways de la Sarthe together with one 1898 Blanc Misseron tram engine, Les Usines de Melle at Melle (Deux Sèvres) which acquired part of the Tramways Départementaux des Deux Sèvres and an 1896 Blanc Misseron tram engine, and the Sucrerie de Montcornet at Renneville (Ardennes) which operates five Corpet Louvet 2−6−0T over part of the Chemin de Fer des Ardennes. The two tram engines are still in existence, although out of use, and there is a possibility that one or both will be preserved. Gasworks and electricity generating stations do not appear to have used locomotives to any large extent but the gasworks at St. Denis, near Paris, had in use up to about 1958 two 0−6−6−0 Mallet tanks built by Corpet Louvet in 1926, undoubtedly the largest industrial engines constructed by this firm. There were also several 0−6−0T in use at this works, and also at the La Villette gasworks in Paris. Contractors’ locomotives, once numerous throughout France, have now virtually disappeared and only one or two firms, engaged principally on SNCF contracts, continue to operate them. In the heyday of this type, Corpet & Louvet supplied many smart little 0−4−0T and 0−6−0T of various gauges. As in this country, several firms specialised in the buying, repairing and resale of industrial locomotives, the principal ones being J. Couthon at La Corneuve (Seine), and Brunner & Marchand at Bouray (Seine et Oise).